Corruption! It’s one of the well publicized vices world over. Everyone is talking about it. The media organize panel discussions on it. 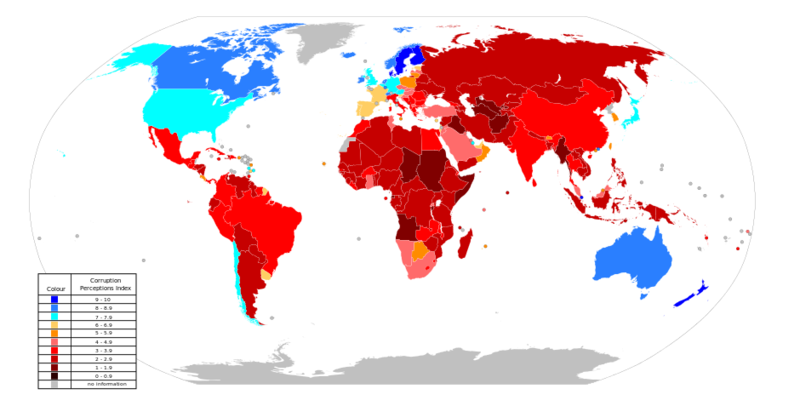 Corruption is a major problem in many countries, including India. As Olusegan Obasanjo, the former president of Nigeria rightly pointed out; ‘Corruption is the greatest single bane of our society today’. Corruption is the misuse of public power for private gain. It has brought a great negative influence on our society. It has become a major bottleneck for the development of the country and progress of the society. Political parties are vying with each other in shouting anti-corruption slogans and leading protest marches. But when they come to power, they forget all these and concentrate on amassing money through the dirty forms of corruption. The corrupt parties lost power in election. Ministers were arrested on corruption charges. Good governance has become only a myth today. Corruption has spread its tentacles over the whole fabric of social life. A psychological approach to the basic problem alone will lead to its solution. Studies have shown that the rich are far more corrupt than the poor. They try to become richer and richer by any means. They would stoop to any unethical means what so ever to get what they want. All they want is money, more and more of it, thinking that money is a source of happiness and pleasure. They are not satisfied with what they have and seek more and more. Their minds are haunted by a strong scarcity feeling. They are unable to feel rich, in spite of their great possessions and positions. They fail to experience the abundance because of the greedy attitude. Moreover they may feel guilty of their unethical desires and actions. They hardly know peace of soul. They only know a lack of good things of life, not their abundance. Their minds are forever, tormented by a feeling of emptiness which disguises itself as a desire for material riches. So the corrupted are scripted in the scarcity mentality. They cannot feel really wealthy or worthy with all the wealth in hand, with all the money in bank. In effect, they live as poor and die as poor, without being aware of their pathetic plight. As we all know self esteem is the overall self evaluation of one’s worth. Researchers have shown that individuals whose self esteem is threatened are motivated to seek any boost to compensate for low self esteem. They may seek for rapid ways to earn more and more money and high status even by unethical means. They use bribery and corruption as an easy means for attaining their aim. It is a fact that lack of self esteem leads to corruption. This is also confirmed by latest research findings. A person with high self-esteem views the world with optimism and confidence. As the famous writer Dorothy Briggs said, ‘High self esteem is not a noisy conceit. It is a quiet sense of self respect, a feeling of self worth’. One’s high sense of self respect and strong feeling of self worth will not allow him to be corrupt. Self worth is far more valuable and precious than money and material possessions to him. He realizes that the real worth is within. It is not what he has that matters but what he is. The former President of India, A.P.J Abdul Kalam once said; ‘If a country is to be corruption free and become a nation of beautiful minds I strongly feel there are three key societal members who can make a difference; they are the father, the mother, and the teacher’. The best way to reduce corruption among the employees of any organization or government is to strengthen their self esteem and to make them aware of the psychology of corruption and the vanity of materialism. Gradually an ‘attitude of giving’ can be developed in them instead of the greedy desire for ‘receiving’, which will ultimately help to inculcate an anti-corruption mentality in them. As the famous American writer, speaker and physician Ben Carson pointed out; ‘Happiness doesn’t result from what we get, but from what we give’. These key values can be cultivated in the minds of the children by their parents and teachers and this will build strong fire wall against corruption in the new generation. St. Francis Assisi has said; ‘It’s in giving that we receive’. We really experience the feeling of abundance and self worth when we are ready to share what we have with others. Mother Theresa was once asked: ‘What is the meaning of life ?. ‘To help other people’; she replied with a smile. Dr. JOHN MUZHUTHETTU is a Human Resource Consultant, National Trainer and Counselor. Formerly he was the Deputy Chief Engineer, Kerala State Electricity Board and is still working as an external faculty of HRD Programmes of KSEB. He is also a faculty of Department of Management Studies, Mar Augusthinose College, Ramapuram, under M.G.University, Kerala. He is the PG course-cordinator of MHRM. Next articleAre You Feeling Lonely And Unappreciated? Thank you so much Jose!